The Gold Standard Tank Sealer will provide superior rust protection and sealing when used in conjunction with KBS Klean and RustBlast. 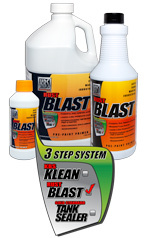 When used together, these 3 products provide you with a coating that will not only Stop Rust & Seal Permanently, but will protect rust from returning. To aid you with your project, we have included the following steps to explain the various stages in Tank Sealing. For an overview of the KBS 3 Step Tank Sealing System, be sure to also check out the KBS Tank Sealer Flow Chart. NOTE: This guide is designed to be an overview. 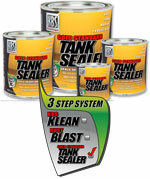 The complete Tank Sealer Directions can be found HERE. 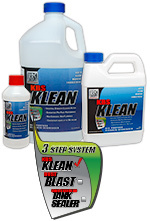 Using a 1:1 dilution ratio, mix KBS Klean with hot water and pour mixture into tank. 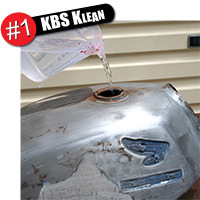 Let tank soak but always rotate it at intervals to ensure KBS Klean covers all surfaces. Empty tank and repeat as often as necessary ... remember the cleaner the tank, the stronger the adhesion of the Tank Sealer. After a thorough cleaning, rinse generously with water until the solution runs clear. Drain tank and let dry. Pour entire amount of full strength RustBlast into a dry tank. Do not dilute. Continually roll tank around to ensure all interior surfaces are kept wet. Repeat rolling and tipping tank every 5 minutes for a minimum of 30 minutes to 1 hour. 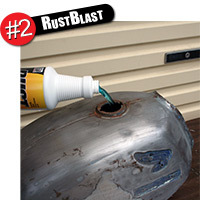 After sufficient wet contact, drain and capture RustBlast in a bucket/container. Repeat process as needed. After rinsing, allow tank to dry completely before proceeding. 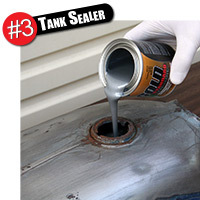 Carefully pour entire contents of can into tank and slowly rotate and roll tank until all sides are evenly coated. Patiently work with sealer for up to 30 minutes. After a thorough coating, patiently DRAIN ALL EXCESS SEALER from tank for at least 30 minutes or more before placing it down for full cure to eliminate the occurrence of pooling and puddles. 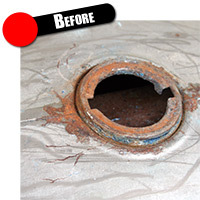 Immediately remove any excess Sealer from threads and fuel lines before curing. NOTE: This is simply an overview of the KBS 3 Step Tank Sealing System. Be sure to read the Complete Directions found HERE.